We anchored up off a swimming pool sized pot hole in Pine Island Sound this morning and for a solid hour caught speckled trout (mostly undersized) on almost every cast. It didn't matter what we threw because they hit everything. I did especially well using a Cajun Cork with a DOA paddle tail underneath it. Gulps were even more effective but there was such a swarm of pinfish in the water that those expensive baits were ripped to shreds after a couple of throws. That's been happening for a couple of weeks now and I don't even bother with live shrimp anymore. They won't last more than a few seconds before the pinfish strip them off your hooks. I couldn't rent a single redfish this morning but my arms were actually tired from reeling in so many trout. Not a bad problem to have in my book. Gotta love the fall on Pine Island. We spotted this beautiful adult eagle feeding on an oyster bar at low tide this morning. They're becoming a regular sight these days as the mating pairs come back to their established nests for the winter. They're a tricky bird to get close to, especially when they've got food. This one was rolling in one of the Matlacha canals today. You can't tell from the photo but it was much bigger than the juveniles that are usually found there. I know I'll see some of you kayak anglers after it in the next few days. Best of luck. Here's a handful of other photos I didn't get the chance to post yesterday. Largest front deck in it's class. Custom helm with full digital gauge package. Rear 35 gallon livewell and additional storage/livewells. Beavertail's new showroom with three skiffs finished skiffs waiting for their owners. Half of the new Aeon/Beavertail shop at Bradenton, Fl. I had the chance to run Beavertail's new 20 footer on the Manatee River in a light chop this morning with the throttle wide open. Just amazing. 72mph with two passengers and a full tank of gas. Massive front deck and no spray. The best tournament boat on the water. Another angle of showing off the front deck area. I watched this white ibis pick baby stone crabs out the grass off Bokeelia for almost twenty minutes the other night. Each time the bird pulled one up it would shake its beak to break of the claw and only swallow that part. This guy clearly knew what he was doing out there. You can check out Beavertail's 75 mph rocket sled this weekend at the Tampa State Fairgrounds. 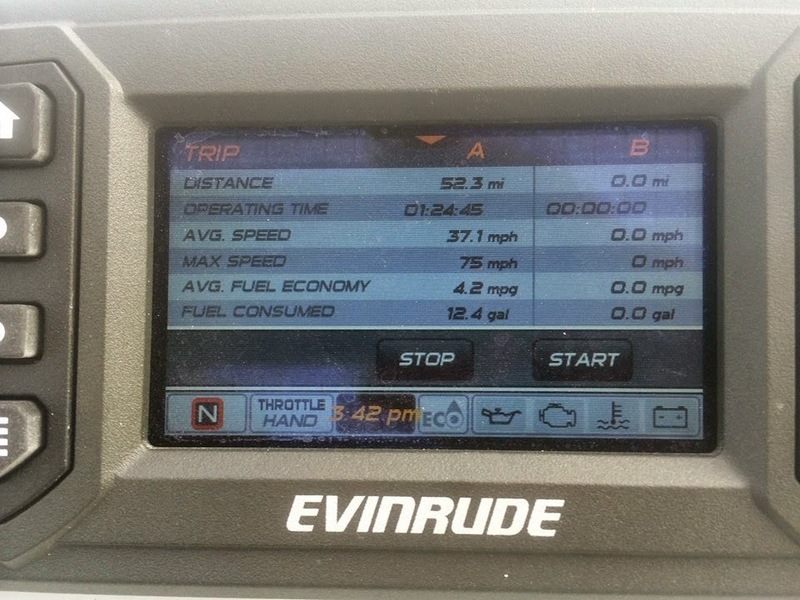 And that's not a typo, the Lightning's top speed with the 200hp Evinrude is really 75 mph. Here's a shot of the GPS to prove it. This boat is actually rated for a lot more power and the next one is being rigged with a 250hp Mercury Pro XS. I'm thinking 80 mph is a possibility. And no, I won't be replacing my 70hp BT3 with a Lightning any time soon. I don't need that much boat but if I ever wanted to make a go at the redfish tournament circuit, it would be on top of my list. Kentucky angler Carol Cook landed this beautiful pompano yesterday on a live shrimp. We were fishing in three feet of water over grass near the Burnt Store bar. To spot these guys, local anglers know to always watch your boat's wake when coming off plane. Pompano will skip out of the water like a Frisbee when spooked and when you see one there are usually others down there. Drift back over that same area and bounce some shrimp off the bottom and you'll usually hook a few. They're great little fighters and look even better on a grill drizzled with melted butter. We've had plenty of all three over this past week off Pine Island. You can check out the all new 20 foot Lightning at this week's Tampa Boat Show. This is the third new boat that Beavertail has launched this year alone, (and it won't be the last.) It's also their first skiff that has no horsepower limits. The one in the photo is packing the new 200 Evinrude Gen 2 and their next one will be rigged with a 250 Merc ProXS. Since the Lightning is aimed right at the tournament anglers, expect to see more than a few of them with 300's on the stern. With its stepped hull and 14 degree deadrise, we might be looking at a top speed in the 80mph range. I'm personally pushing them to hang a Seven Marine 557 on their next demo model. 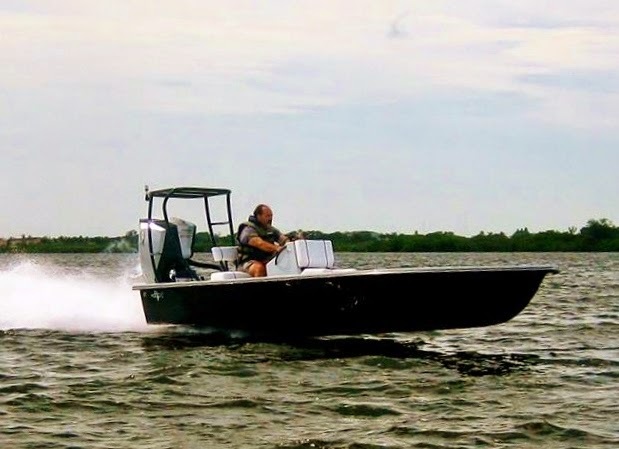 The Lightning will also be at the Tampa Florida Sportsman's Expo on the weekend of the 13th and then they'll take it on the road for free test rides, so expect to see one here on Pine Island later this month. Once again, you can catch and keep a slot-sized snook during the fall season in SW Florida. My buddy Tyler Davis landed this almost-legal fish this morning in the southern part of Matlacha Pass. We also boated a couple of smaller snook along with some bigger trout and a 26" redfish to complete the Slam. An excellent morning on the water.